Franklin Electric equipment is intended for installation by technically qualified personnel. Failure to install it in compliance with national and local electrical codes, and within Franklin Electric recommendations, may result in electrical shock or fire hazard, unsatisfactory performance, and equipment failure. Franklin’s SubDrive and MonoDrive systems have both red and green lights. What do they do? The green light is the power light. When green is on steady, it means the unit has electricity and is waiting to run. Not unlike sitting on the sidelines waiting to play in the big game. Once the pump and motor are activated, the green light begins to blink. A blinking green light tells you everything is “good” and your system is running. When the red light is on, it means the SubDrive or MonoDrive has found something it does not like. It is like the “check engine” light on your car. While it may continue to operate, the red light means something is not quite right and your system is calling for help. Troubleshooting submersible water systems involves using test meters to check something underground you can’t physically see. When the winding and insulation resistance readings are out of spec, you have to trust the meter is providing accurate information. Most installers would rather not pull a pump that doesn’t need to be pulled. One way to confirm your ohmmeter and megohmmeter AKA megger, readings are correct is to purchase some resistors from an electronic parts store such as Radio Shack. Purchase several different resistors in various sizes with 1% or better tolerance. That way if the resistor is a .5 ohm resistor, your meter should read .5 ohms plus or minus 1%. Resistors are also available in millions of ohm values or megohm values. Use these to check your megger. If the meter reads correctly, you know your motor readings are valid. If the meter reading is off when tested against a known standard, then you know it is time to have the meter factory calibrated. For a very small financial investment in resistors, you can verify your meter readings and know you can trust your meter. 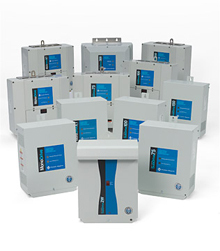 Franklin Electric offers many different constant pressure systems. What are the differences? Different models for different horsepowers. Different horsepowers for different water needs. MonoDrive is for Franklin 3-wire, 230-volt, single-phase motors, ½, ¾ and 1 Hp. MonoDrive XT is for Franklin 3-wire, 230-volt, single-phase motors, 1 ½ and 2 Hp. SubDrive 2W is for Franklin 2-wire, 230-volt, single-phase motors ½, ¾ and 1 Hp. SubDrive 75, 100, 150 and 300 are for Franklin 230-volt, three-phase motors 1 ½ Hp, 2 Hp, 3 Hp and 5 Hp respectively. If Franklin motors have built-in overload protection, why didn’t the overload trip when my pump deadheaded? Franklin Electric motors have built-in overloads in all 2-wire motors, as well as 1 hp (and smaller), 3-wire motors. Internal overloads function on a combination of high amperage and temperature, and in a deadheaded condition motor amperage drops considerably. Therefore, the overload will not trip because it is looking for high amps. No gate valves or shutoffs in the plumbing: how can the system deadhead? Situations like, the inlet to the pump plugged with debris, iron, bacteria, or algae; if a waterline between the pump and motor and tank would freeze; or if something keeps a check valve from opening properly could cause the motor to run in a condition like deadhead. Franklin Electric Pumptec and QD Pumptec are no-load or out-of-water sensors. They monitor and diagnose motor load to prevent pump or motor failure due to adverse conditions such as low-flow wells, pump damage, clogging, bound pump, or power mishaps. Not all pumps react the same under deadhead conditions. Many deadheaded pumps can still load the motor sufficiently to satisfy the Pumptec and QD Pumptec, so they are not guaranteed trip. 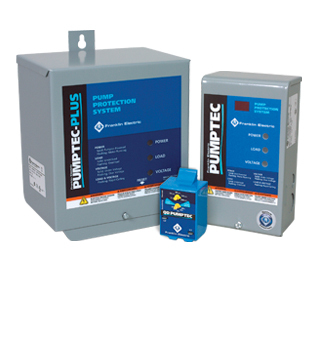 Franklin Electric’s Pumptec Plus looks for a 25% change in the watt draw of the motor starting from its calibration point; the installer, based on actual running loads, sets this calibration point. Do abandoned wells have potential for contamination? Wells that are no longer productive should be properly filled and sealed to protect our ground water resource. As far as the motor, Franklin Electric submersible motors, used in water well installations, are filled with a non-toxic water based mixture. Material Safety Data Sheets (MSDS) are available upon request. Do I still need a pressure tank with a Franklin constant pressure system? Variable Frequency Drive systems including Franklin’s MonoDrive and SubDrive still use a bladder tank but are typically much smaller than one sized for a standard system. In a SubDrive or MonoDrive installation the tank’s role is to capture water turbulence, not store water. The MonoDrive and SubDrive systems are designed to hold water pressure to plus or minus one psi of the set point. With a switch this sensitive, any water turbulence around the pressure sensor would cause wider pressure swings. The tank’s job is to capture any wave action in the plumbing coming from the pump side, so the water moving around the pressure sensor is smooth and steady. The gallons per minute, or gpm rating of the pump, determines the size of the tank needed. The tank’s air pre-charge is also different than a conventional system. Please see your installation manual for complete instructions. What is a Subtrol Sensor? Franklin’s motor literature talks about a Subtrol Sensor; what is that? The Subtrol Sensor is a thermostat and transmitting device buried inside certain Franklin Electric 3-phase, 6- and 8-inch submersible motors. The Subtrol Sensor is used in combination with Franklin’s SubMonitor protection device. If the internal temperature of the motor becomes too high, the thermostat turns on the transmitter. The transmitter then sends a signal up the motor wires, which is picked up by the SubMonitor in the pump panel. By using a Subtrol equipped motor and the SubMonitor, you get high temperature protection without running extra wires down hole. Power supply of 50 or 60 Hz? Maximum amp rating of the motor? 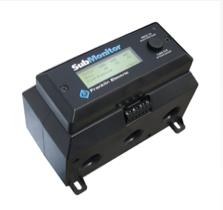 Everything else is factory set in the SubMonitor to provide optimum motor protection. Franklin Electric advised that FCC regulations prohibit them from repairing or replacing faulty circuit boards in the Monodrive Controller. This means that the failure of a $1 transistor results in a $1500+ replacement cost. Before committing to such an expense check with your local electronics repair technician and you may save $$$$. 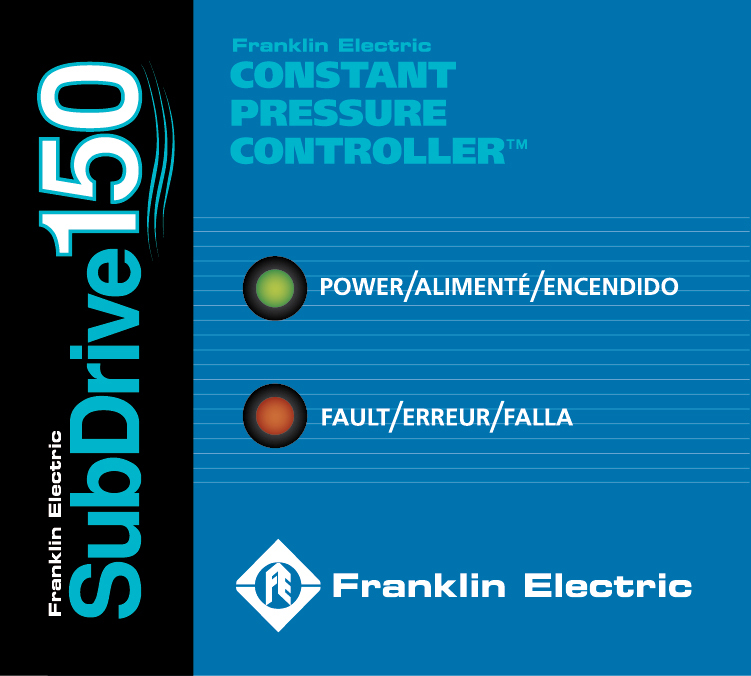 We’re sorry that you had a failure with your Franklin Electric MonoDrive constant pressure controller. In terms of repairing your MonoDrive at the component level, there are a couple of issues. The first is compliance with the UL standards to which Franklin Electric adheres. The UL approval process includes manufacturing standards and the product is UL approved when it leaves our manufacturing facility. However, once the product is modified outside the factory, that UL approval may be lost. Thanks for your comments and the link that you sent. While I understand that microcircuitry is not designed to be repairable I do find it regretable that major components – such as the J3 circuit board that simply plug in – cannot be replaced if they fail. As it happens, I was able to get mine repaired for $150 which is less than 10% of the MRSP and it is now working fine. Of course I appreciate that not every component failure is that easily repaired, but given the option between spending CAD$1600 or $150 I am prepared to accept that the repaired component may not meet UL standards, since the original unit caught fire I have to question if it met them either. As for the analogy with cell phones, if mine dies Bell will give me a new one so I don’t really care if it can not be repaired 🙂 Though in my experience most cell phone problems -including broken screens can be fixed and they rarely catch fire.